Item Description: You might be short on space, but you can still long for style. If contemporary tantalizes your taste buds, savor the beauty of this sleek drop leaf dining table. Dark and dramatic, it packs plenty of appeal into a compact design. Series Features: Made with select birch veneer and hardwood solids in a transitional dark brown finish with gray undertones. 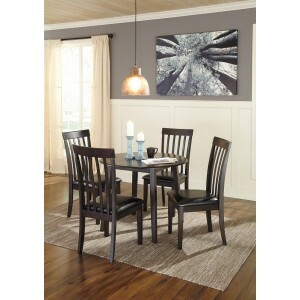 Compact table seats four and includes drop leaves for multi-function.